Spitsbergen is a special Naval Forces map, used for submarine battles in the 2018 April Fools Day event Silent Thunder. The map is set in the icy waters off the coast of Svalbard. 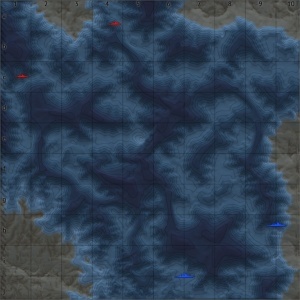 The sea floor of the map is uneven and has numerous rock / ice formations which can be used to hide your submarine. There a number of sunken ships and submarines located around the map as scenery. Ice sheets and icebergs cover a large amount of the water's surface preventing submarines from surfacing in some areas and providing a navigational hazard for submarines / torpedoes near the water's surface. The submarine area is 12km x 12km and the air battles area is 65km x 65km. In clashes between three of the major military powers of the 21st century, players will battle against each other in combat in some of the world's most powerful nuclear submarines. Three Dimensional depths of the ocean, realistic physics and modern strategic weaponry will become available this weekend. This map is inspired by the coast of Spitsbergen, the largest island of Svalbard. The waters around Svalbard are of strategic significance to Russia as its Northern Fleet, based out of Severomorsk must pass through the stretch of ocean between Svalbard and Norway in order to reach the Atlantic Ocean. In a wartime situation it is likely that NATO and Russia would be operating submarines in the area to attack / defend the Northern fleet as it entered and left the Atlantic. In Deathmatch there are no capture points, players spawn ion the north and south and as a team must score 30 kills against enemy submarines in order to win. In the normal underwater hunting configuration there are two capture points, one on the eastern edge of the map, and one on the western edge. In order to win a team must capture one of the zones, at which point any submarines in the zone will fire their ballistic / cruise missiles, ending the game. The Underwater Hunting configuration (placeholder map). This page was last edited on 30 January 2019, at 05:13.